← Sheila Turnage. Three Times Lucky. New York: Dial Books for Young Readers, 2012. Lucy Arlington. Buried in a Book. New York: Berkley Prime Crime, 2012. Lila Wilkins has worked at the Dunston Herald for twenty years, so she is shocked and enraged when, at age forty-five, she finds herself jobless. But Lila isn’t one to lie around and wait–within a few minutes of finding out about her layoff, she’s on the phone interviewing for an internship with nearby publishing house, A Novel Idea. An internship may seem like small potatoes to a seasoned journalist, but the ad states that she could be promoted to full-fledged literary agent within three months, so Lila dives in. A Novel Idea has revitalized the small, neighboring village of Inspiration Valley. Bentley Burlington-Duke, director of the agency, is a North Carolina native who made her money in New York City. Now she’s determined to make North Carolina the hub of publishing in the South. Bentley isn’t an easy person to get along with, however– A Novel Idea’s interns only seem to stay a short time, despite the promise of a permanent position. Lila is going to have to stiffen her spine in order to achieve the coveted status of literary agent. It doesn’t help that on her first day, a prospective client dies in the foyer. Marlette Robbins was a local ne’er do well with a bad reputation, but something about his death strikes Lila as odd. Soon she’s embroiled in the investigation, to the (slight) annoyance of attractive local policeman Sean Griffiths. But soon Lila is in deeper than she realized, and it’s possible that her very life could be on the line. Will she survive? And more importantly, will she ever be a literary agent? 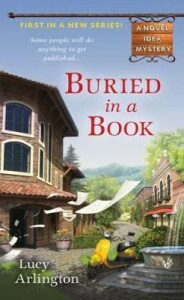 Check out this first book in the Novel Idea Mystery series in the UNC-Chapel Hill Library catalog.